Pearl Harbor Naval Base, Hawaii, has been the homeport of the U.S. Navy’s Pacific Fleet since 1940, when the fleet moved from the west coast of the North American continent to serve as a buffer against Japanese expansionism. Today the working naval base, about two miles west of Honolulu International Airport, exists alongside the living remnants of the 1941 attack. While public access to the base is restricted, there are several memorials and museums accessible to civilians who want to pay their respects to, or simply learn more about, heroes and victims of the attack on Dec. 7, 1941. 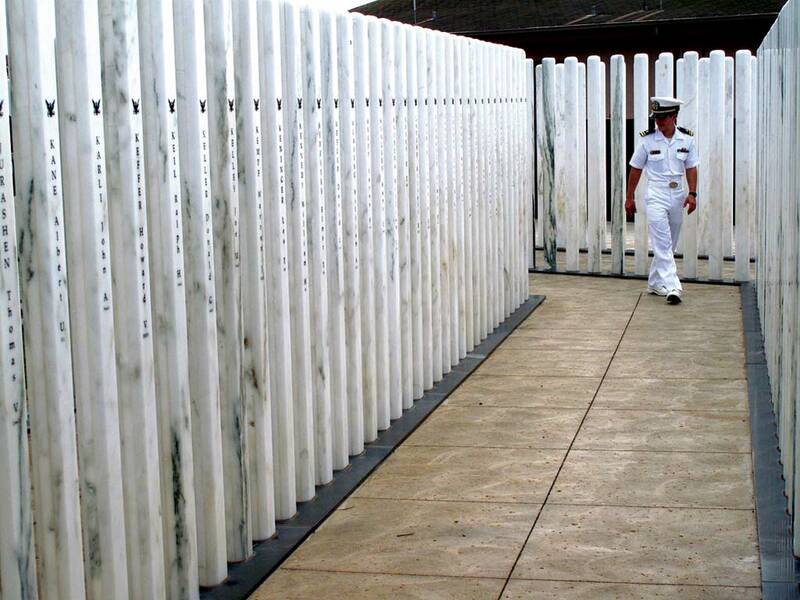 In Hawaii, the national monument’s installations are anchored by the USS Arizona Memorial and its shoreside Visitor Center. The Visitor Center, remodeled in 2010 to serve as a portal to all the monument’s Hawaii sites, features a number of interpretive historic and cultural exhibits not only on the Pearl Harbor attack, but on its prelude and aftermath. Many of these exhibits, as well as the center’s bookstore and gift shop, are the work of Pacific Historic Parks, a nonprofit that supports educational programs at four National Park Service sites throughout the Pacific. While many other ships were damaged, and many of their crew members killed or injured during the attack, the scope of the USS Arizona’s loss in 1941 became the focal point for a nation that had been divided over U.S. involvement in the war. Likewise, the Arizona’s memorial – perhaps the most famous and most frequently visited war memorial in the United States, receiving about 1.6 million visitors each year – has become emblematic of the feelings of loss, grief, and pride for the people who served and died throughout World War II. Though some efforts were made to remove ordnance from the Arizona after it was sunk, the ship was too badly wrecked to be raised again. With wartime efforts focused on salvaging and refloating ships that could be saved, it was also decided not to attempt to recover the bodies of the dead, though about a hundred were recovered initially. The rest are considered buried at sea by the U.S. Navy. 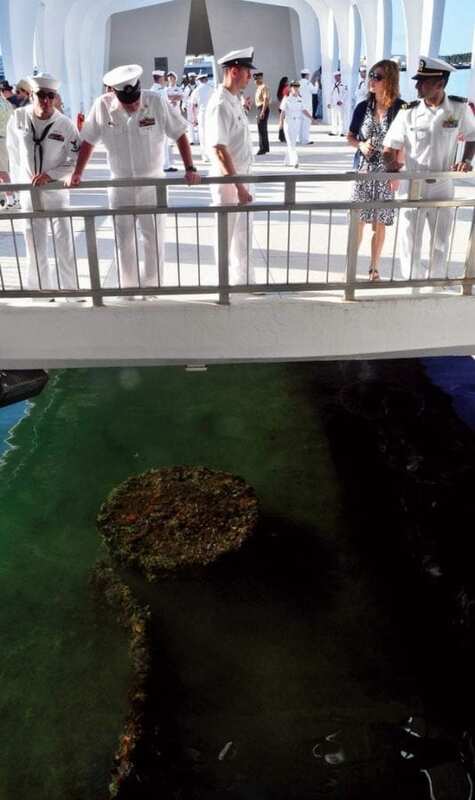 About 900 men are still entombed in the vessel’s remains, which lie in 38 feet of water, with some rusted parts – including the prominent rusty barbette of the Number 3 gun turret – still protruding from beneath the water. In 1950, then-Commander-in-Chief Pacific Fleet Adm. Arthur W. Radford ordered a flag flown and a plaque placed over the sunken hull of the Arizona. In 1958, President Dwight D. Eisenhower approved the creation of a larger memorial, which was completed within three years and dedicated on Memorial Day 1962. The National Park Service assumed operation of the USS Arizona Memorial in 1980. The simple white concrete structure, 184 feet long, is perched transversely over the sunken hull of the battleship, supported by two enormous concrete girders. The memorial is reached by shuttle boat, and access is gained by formal stairs at the harbor end. The memorial itself is divided into three sections: an entry or assembly room, a central area used for ceremonies and for viewing the sunken ship, and a shrine room, where the names of those lost on the Arizona are inscribed on a marble wall. A few small steps lead up to the wall where leis, flowers, and wreaths are usually placed in remembrance. A separate marker is devoted to 16 survivors who chose to be reunited with their shipmates in the waters below. The main central area includes a viewing well that looks down below the surface of the water, at the vague outline of the ship’s remains. The flag over the memorial flies from a pole attached to the ship’s severed mainmast. A visit to the memorial begins onshore at the Visitor Center, where free guided tours begin with a brief talk by a park ranger or a Pearl Harbor survivor, followed by a film about the attack. The center is open from 7 a.m. to 5 p.m. daily, except for Thanksgiving Day, Christmas Day, and New Year’s Day, and tours generally begin every 15 minutes from 8 a.m. to 3 p.m. A Navy-operated tender takes successive groups to the memorial structure. During this ride, as the shuttle boat passes the sites of other ships sunk or damaged in the attack, a narrative audiotape relates what happened on the morning of Dec. 7, 1941. The entire tour typically takes about 75 minutes. Because the memorial is also a burial site, it is a very solemn place. The assembly room is capable of holding only about 200 people at once, so the line-up for tours at the Visitors Center is often long – a two-hour wait on most days – and tickets are usually gone by early afternoon. The best time to arrive is before the doors open at 7:00. Like the Arizona, the USS Oklahoma was one of eight battleships moored in a line of deepwater berths known as Battleship Row, along the southeast side of Ford Island. The Oklahoma, like the Arizona, did not survive the attack; the six other battleships in Pearl Harbor – Pennsylvania, Tennessee, Maryland, California, West Virginia, and Nevada – later returned to service. The Oklahoma suffered three torpedo hits almost immediately after the first Japanese bombs fell on Pearl Harbor. Two more struck the ship’s hull as it began to capsize, and the members of its crew who attempted to abandon ship were strafed by gunfire. Within 12 minutes of being hit, Oklahoma had sunk, rolled over with its masts touching the bottom of the harbor and part of its keel exposed. A staggering 429 of its crew were lost, though many survived to join the fight – earning three Medals of Honor, three Navy and Marine Corps Medals, and a Navy Cross among them. The wreck of the Oklahoma capsized and sank while being towed to San Francisco for scrapping in 1947. In Pearl Harbor, the sole reminder of its service is a polished black granite monument near the spot where the ship was moored on Ford Island – accessible by taking the Ford Island shuttle from the Visitor Center to the USS Missouri Memorial. Battleship Row vessels were tied off to huge black-and-white masonry mooring quays, many of which still stand today. Mooring quays F6, F7, and F8 are part of the World War II Valor in the Pacific National Monument. The Utah rests on the west side of Ford Island in Pearl Harbor, where it had returned in early December 1941 after completing an anti-aircraft gunnery cruise – its final voyage. At 8:01 a.m. on Dec. 7, the ship took two torpedo hits and listed so quickly that the order was given to abandon ship. Within 12 minutes, the battleship had rolled over and was keel up, a total loss. Fifty-eight of the ship’s crew were dead, and most still lie with the sunken remains. The Utah was later rolled over to clear the channel, but was left on the bottom. A memorial plaque was affixed to the overturned hull of the ship, but in later years a more permanent and accessible memorial was constructed: a 70-foot walkway, extending out from Ford Island to the Utah’s partially exposed hull. The brass plaque commemorating the loss of the Utah is mounted here, at the base of a flagpole. Because of its location within the confines of an active military installation, the Utah Memorial, a National Historic Landmark, is normally open only to visitors with a government ID card. Also included in the national monument are five chief petty officer bungalows on Ford Island, adjacent to Oklahoma’s mooring quays. They are the last remnants of the CPO neighborhood, the homes that were closest to Battleship Row. Once slated for demolition, the bungalows were saved by the efforts of community members – including the Historic Hawaii Foundation – and, while still owned by the Navy, are managed by the National Park Service (NPS), which mistakenly tore one of the bungalows down in June, 2016. The NPS plans to restore the remaining five, beginning with Building 29. The bungalows have not yet been made available to the public.